Air plants are a beautiful, unexpected addition to a modern floral arrangement! And they're even prettier when you mix them into a modern fall wreath. With this project, you can stretch your floral arrangement skills and create something beautiful to display in your home for the autumn season. Choose some of your favorite fall floral stems to accentuate your home decor, and create a one-of-a-kind piece that you can use year after year. Whether you make one for yourself, or as a gift for someone you love, it's guaranteed to be a beautiful addition to your fall decor. For this project, you'll need a variety of faux florals that fit with your fall decor style. This year, we're loving a mix of blush tones with neutrals and earth tones, but you can choose any colors that you love. To create the wreath, try to find a few small spray florals, along with one main statement floral. Have some extra greenery or filler to cover any holes. And then find some of your favorite color and shape of air plants to finish it all off. For your first floral, choose a small spray or floral pick that has a bit of filler and some interesting florals. We used a small pick featuring natural cotton and greenery. Cut off a few inches of your floral wire. Hold the stem of the floral firmly to one side of the gold hoop. Start wrapping the wire around both the stem and the hoop, affixing them tightly together. Trim any loose or extra ends of wire. Choose a statement piece or floral bloom. Cut off the long stem. Cut another few inches of floral wire and wrap the floral onto the gold hoop, layering it over the first stem that you placed on the wreath, a couple of inches loose. Use another piece of filler or a floral pick to create another layer on the wreath. This piece can be placed on the lower portion of the wreath, creating more depth and fullness to the florals. If your faux air plants have stems, cut them off at the base of the area where the air plant bloom begins. 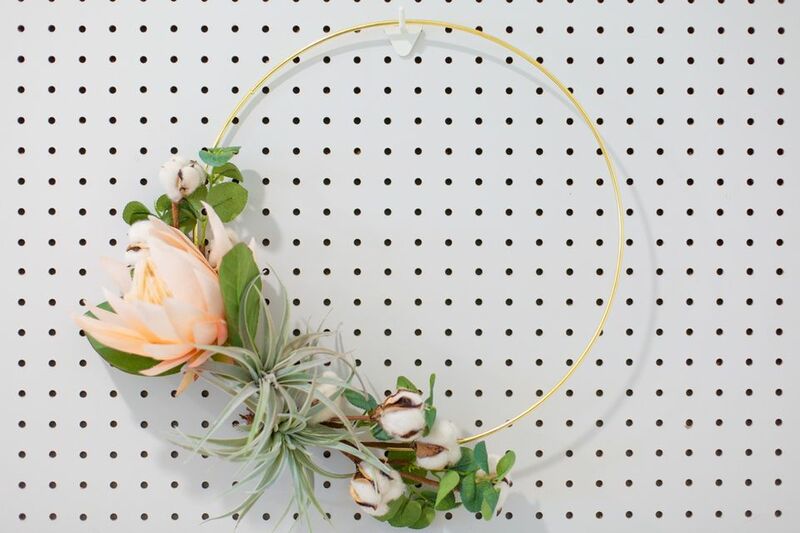 Use a piece of floral wire to weave through the base of the air plant and around the gold hoop. Secure your air plant to the middle of the area where you're placing the rest of your florals, giving them a featured place in your arrangement. If you like, add more than one! Hang your wreath on a door, window, or wall, and enjoy it all autumn. Additionally, we think these wreaths make wonderful decorations for seasonal bridal showers and weddings—they're an inexpensive, chic, and Insta-worthy DIY! The great part about this craft is that while the wreath is secure, the wire should be easy enough to unwrap if you want to change out the arrangement season-to-season.